Affordable Capacity: The definition of the Regional Jet Market. Highlights: The death of the 70 seat regional jet market, shifting market trends, and what airlines seem to trend on: affordable capacity. 50 seat regional jets heralded a new way to travel. Comfort and speed were real reasons, and offering a jet to regional customers, as opposed to a turboprop aircraft, suddenly seemed very attractive. The Embraer ERJ 145, introduced in 1996, and the Bombardier CRJ 100/200, introduced in 1992, both extremely popular 50 seat airplanes, sold 708 airplanes and 935 airplanes, respectively. Regional aviation only continued to grow, fuelled by more efficient jets that promised good operating economics. According to Bombardier’s study in 1998, there was a growing requirement for larger aircraft in the fleets of the world’s regional airlines. To keep up with the growth in mainline fleets, Bombardier felt that regional fleet must grow in both size and capacity. The company felt that if the regional fleet did not grown beyond 50 seats, the number of 50-seaters required to satisfy demand would quadruple. Because of this growth, regional airplanes grew in capacity, to match demand. The CRJ 700, a 70 seat regional jet from Bombardier, was introduced in 2001, and the competing Embraer 170 was introduced to airline service in 2004. As airplanes grew in size, the operational costs per seat started to fall, further opening up regional aviation to larger airplanes while gradually declining the smaller regional jet market. The market shifted, and continues to shift towards larger sized regional jets. The CRJ 100/200 is no longer in production. In 2008, the Embraer 145 had 733 firm orders, which slumped to 708 in 2009, and has remained at that figure, over 4 years till date. By 2011, all orders had been realised through deliveries. The 50 seat jet market effectively and statistically died many, many years ago. The CRJ 700, when introduced, did exceedingly well. Between 2000 and 2010, the order book grew by 160%, to 344 firm orders. The Embraer 170, which had a late start, touched 194 firm orders in 2009. While these were fairly good figures, the market shift hadn’t stopped. The Embraer 190, and the CRJ 900 have seen the greatest sales growth. The E-190, when introduced in 2005 with JetBlue, had 185 firm orders. This has seen a fairly steady, and unparalleled growth to 560 in 2013: a growth of 200%. The CRJ1000 was Bombardier’s answer to the E-190, but that entered service very late, almost 5 years later, in December 2010, but firm orders stand at only 70, as of July 2013. 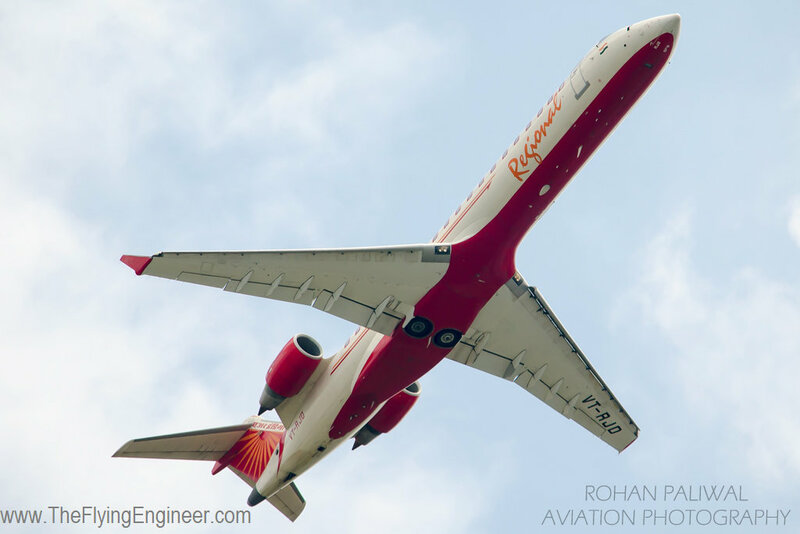 The CRJ1000 is not much of a competitor to the E-190; The longest range version of the jet, 1,622NM, falls short of the shortest range version of the E-190: E-190STD at 1800NM. The E-190AR has a range of 2400NM. While there was such encouraging growth in sales of 100 seat airplanes, The CRJ700 stopped building orders after 2010. In fact, after 2010, 4 firm orders were lost, with the number lazily bouncing back to 347 in 2013. After 2009, The Embraer 170’s firm orders only reduced, and hasn’t recovered since. It’s not the manufacturer. It’s the market, and the 70 seat regional jet isn’t favoured anymore. As of Sep 2013, there is a backlog of only 6 E-170, of which 2 are for Japan Airlines and 4 for ETA Star Aviation, India. The 78-88 (80) seat E-175 is the next-best received aircraft. Orders for the type are nowhere close to that of its longer, 100 seat E-190, and had stagnated for more than 1 year in the period after 2011, at the level of the dead-market E-170. A sudden surge in orders, of 65% to 315 in 2013, is thanks to Skywest, which placed a large enough order for the type. The 90 seat CRJ900, has 306 firm orders in 2013, and witnessed a 380% surge in orders between 2005 and 2007. A 2000NM range airplane with the ability to carry 100 passengers has been the hottest selling cake. Add another 16 to 24 seats and the offering, the E-195, isn’t quite as attractive. Bombardier’s response to the E-195 is the 125 CS100, and the unique, hitherto unmatched offering is the 135-160 seat CS300. Proof that the market is shifting away from 70 seat jets is the fact that Embraer, that has moved forward with its plans to re-engine, significantly re-engineer and update the E-Jets to a “Second generation” of E2 jets, has the E-195-E2, the E-190-E2, and the E-175-E2, but no plans at all for the E-170-E2. The market needs higher capacity airplanes for greater flexibility, provided that it doesn’t come at the cost of economics and performance. With economically better performing or promising airplanes hitting the market, “affordable capacity” is the market demand. And since the E-175-E2 is planned for a 2020 Entry into service (EIS): the last amongst all re-engined E-Jets, it’s a sign of the 80 seat regional jetliner’s grave being prepared, next. Something to add to the above . After the recession in early 1990 the airlines negotiated with Pilot Unions to raise the number of seats that their Regional Partners can carry . Thank you for that view! Wonderful!